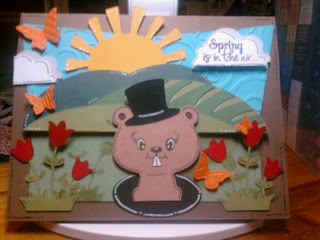 Today Phil the Groundhog did not see his shadow which means he is predicting Spring will be here soon!! With all the ice around here I am not surprised but Thank You Phil! In honor of my special friend whom I will forever share this special day with, I made a "Spring is in the air" card. I knew as soon as I saw Cooking with Cricut's Shadow challenge that I needed to enter it! You may recognize the backdrop from my daughter's BDay invitations. I'm recycling the leftovers but I think it worked perfect! I also used one of Emma's new stamps from her Color Me Happy set found at http://www.creativetimeforme.com/ They are wonderful!!! I tried sponging shadows around my cut images using the cut sheet. I did not get the effect I wanted so I also added a lot of dimension so I could get some good shadows. All the paper is Stampin' UP!, butterflies are a Stampin' UP! Embosslit, cricut cartridges used where Create A Critter and Country Life and I also used Peachy Keen's Critter Face stamp. Again, sorry for the terrible picture. My new part for my laptop was shipped but is sitting at the hub in Chicago (it may be there for awhile). Thanks for stopping by today and remember, SPRING IS COMING!! Very cute, love the groundhog. Thanks for playing along with us at Cooking with Cricut. Awesome card, Amber! So much detail and super cute. Your little groundhog is adorable! Thanks for joining in on our "shadowy" challenge this week at Cooking With Cricut. You won My Pink Stamper stamp set Love-alicious! I just need you to send your mailing address to mypinkstamper@gmail.com. Congrat on winning the My Pink Stamper stamps you will love them!! Adorable card! !